The fly-in, organized by a 15-year-old student, marks the famed aviator's touch-down 90 years ago and raises money for the Make-A-Wish Foundation. OLD ORCHARD BEACH — Thousands of people lined Old Orchard Beach on Sunday afternoon to watch 15 small planes descend from the sky and land on the sand, much like aviator Charles Lindbergh did 90 years ago. After taking off from Biddeford Municipal Airport a few miles to the west, the parade of planes circled to the east and then came in from the north to land on the beach under cloudless skies. Organizers estimated that between 5,700 and 6,300 people attended, standing 20 feet deep along 3,500 feet of barrier fencing set up to keep them off the landing strip. The huge turnout was beyond organizer Chase Walker’s wildest expectations. “I am very surprised,” said Walker, a 15-year-old who came up with the idea to commemorate the 90th anniversary of Lindbergh’s famous surprise beach landing of the Spirit of St. Louis on July 24, 1927. With just a couple of days’ notice, organizers had to move the event from Saturday to Sunday because of windy weather, causing 22 pilots to drop out because of prior commitments. But that didn’t appear to dampen the sense of anticipation Sunday as spectators arrived and police in dune buggies cleared the beach. Finally, the small planes came into view, distinguishing themselves as they drew nearer from the seagulls wheeling overhead and their buzzing engines overwhelming the crash of the surf. The crowd clapped and cheered as the planes touched down. Walker hatched the idea for a fly-in more than 18 months ago and mentioned it to his eighth-grade language arts teacher, Nikki MacDonald. She put him in touch with her sister, Sharri MacDonald, president of OOB365, a volunteer group that promotes town events and festivals. The two joined forces, and planning for the fly-in took off. 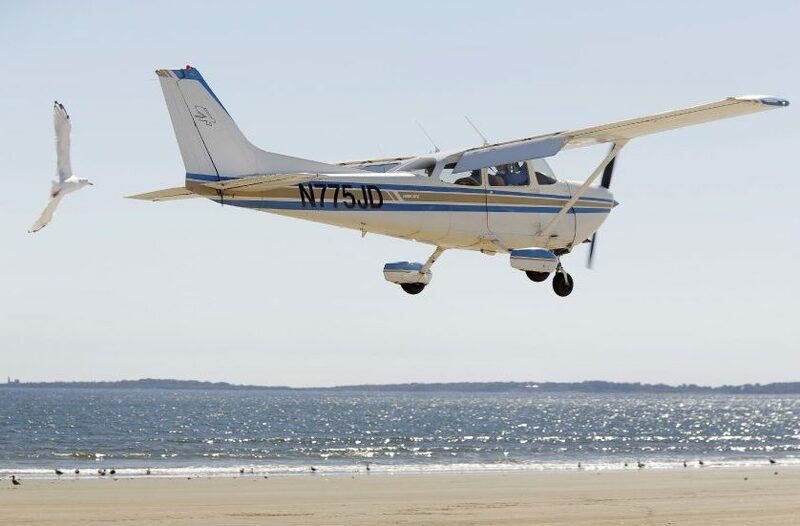 They obtained town approval to host the fly-in and touched base with the Maine Department of Environmental Protection and the Federal Aviation Administration. The Libby Memorial Library put up a display of historic photos of Lindbergh’s unplanned landing during his 48-state victory tour after his historic flight between New York and Paris. Lindbergh had been heading for the Portland airport – for a dinner and ceremony in the city – when both he and his guide plane became disoriented by heavy fog. The guide plane landed in a Dayton field. Lindbergh knew pioneer aviator Harry Jones’ hangar at Old Orchard Beach was next to a natural landing strip that appeared at low tide. 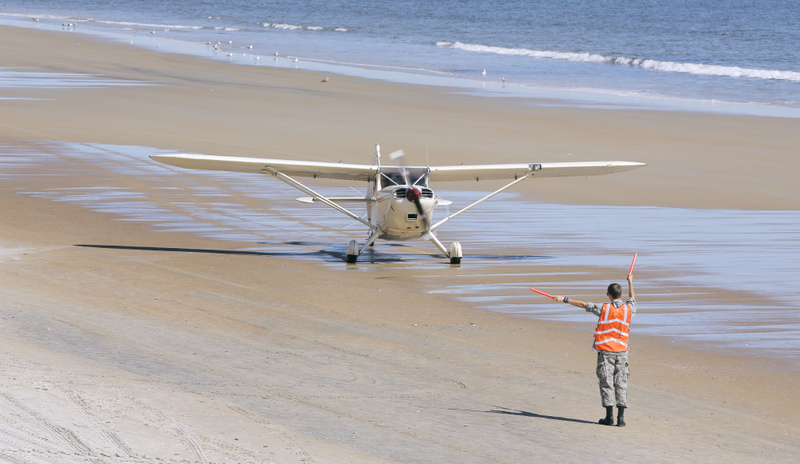 So Lindbergh decided to land on the beach rather than try to find the Portland airport in all the murkiness. Jones used the landing to spread the word that Old Orchard Beach was superior to New York as a starting point for a trans-Atlantic flight, because it was closer to Europe. Eight trans-Atlantic takeoffs from Old Orchard Beach followed in the next 12 years. 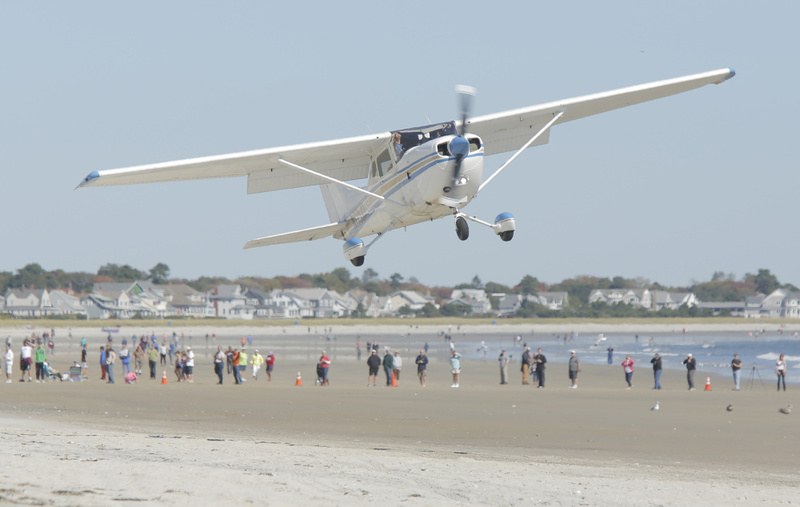 Although there have been several commemorative fly-ins at Old Orchard Beach in the years since the Lindbergh landing, Sunday’s event was the first in 40 years. 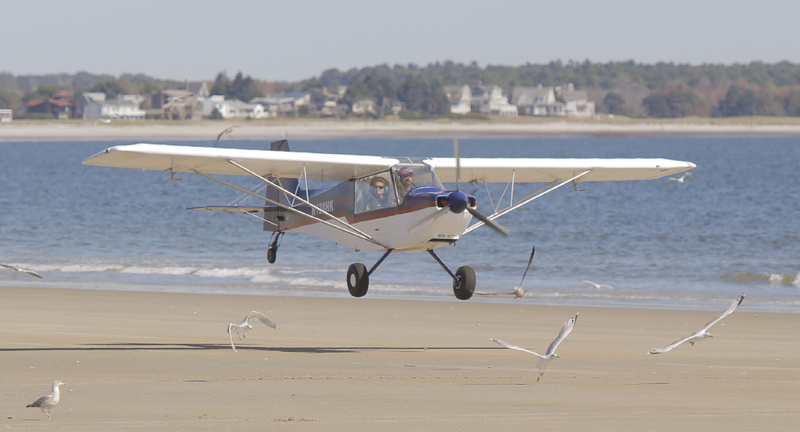 The chance to watch small planes landing on the wet sands struck a chord with the public, with visitors showing up from across New England and Quebec to sign the guest book at the Old Orchard Beach Historical Society’s kiosk. Walker, who dashed around the beach with a walkie-talkie, was interrupted by a steady flow of well-wishers. “Smart kid, huh?” said Cindy Ayotte of Dayton. Wanda Roberge of Longmeadow, Massachusetts, who came to Old Orchard Beach to celebrate her sister-in-law’s 60th birthday, said she was delighted when she discovered the fly-in would coincide with the visit. Roberge said she felt compelled to personally congratulate Walker. “This is a gift,” she said. The Wings 4 Wishes event raised money through contributions from spectators for the Make-A-Wish Foundation, but organizers won’t know how much was raised for a few days, said Sharri MacDonald.